In my article today, I decided to tie together three recent things that all (somewhat) tie in to inflation. First, I believe they are lying to us, again. Second, I wanted to show a couple of, well, unusual, ways to fight inflation, even if they are not practical for most people, but they are interesting! But this reminded me of something about the US $50 FRN I ran into maybe a year or so ago. The ATM that I normally use changed their payout from 25 * $20 bills (for $500, my limit) to FIVE $20 bills and EIGHT $50s. I mentioned this in a blog piece, and asked if others of you were having similar experiences (getting fifties from the ATM, I had never seen that before in the USA, in Europe yes, I had seen 50 euro notes and smaller come out of their machines in Italy, for example). I now have little trouble getting even a small retailer to take a $50 for small purchases (like at 7-11). When I was young, sometimes retailers would complain if I tried paying with a $20 for very small purchases. So, it looks like the $50 has become "the new twenty". Several years ago, I hardly ever even SAW fifties, but now I get them, and spend them everywhere. This is yet another sign of inflation. More currency coming into the system. Barron's, the weekend financial paper, shows ("Federal Reserve Data Bank", page M49 in my edition) that "Currency in Circulation" is about $1.284 trillion, up some 88.9 billion from last year. That works out to some 6.8% increase in actual currency supply. In my eyes, that translates to 6.8% inflation. So, depending on how you want to look at it, there is at least an inflation of 6.8%, perhaps quite a bit higher. I think that 6.8% is a reasonable minimum figure for inflation. As is so typical, it looks like they are lying to us as usual. Within the past week or so my one troy ounce of iridium arrived! 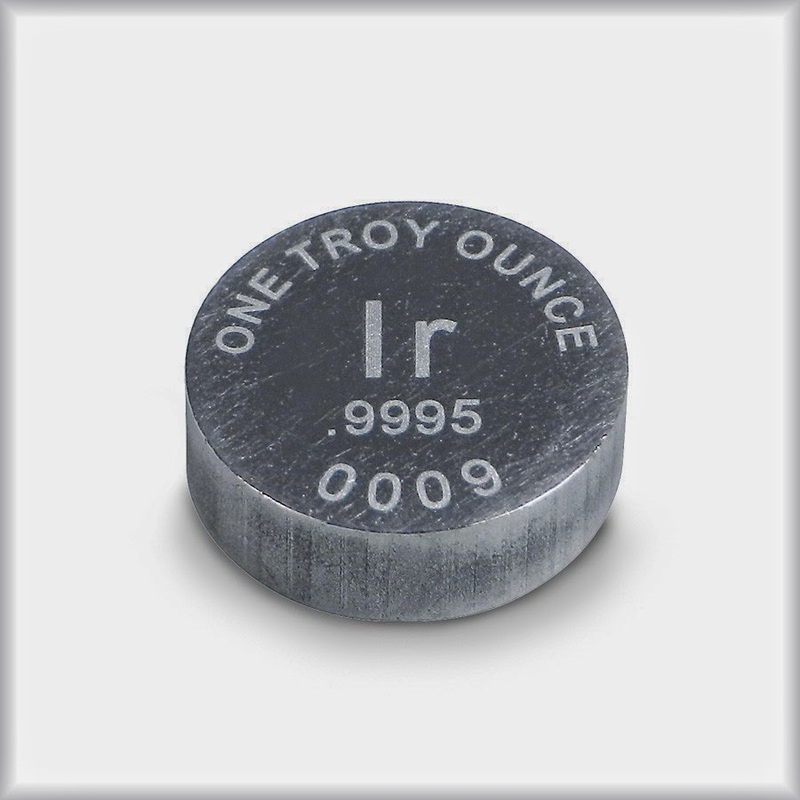 Iridium is the second heaviest (stable) element that exists, it is just barely beaten out by osmium. The density of iridium is 22.56 g/cc and for osmium the density is 22.59 g/cc, essentially identical (just 0.13% difference). For reference, platinum has a density of 21.45 g/cc (so some 5% less) and gold comes in at 19.30 g/cc. Note the fine powder I "stacked" up for clarity, the color is indeed a dark gray. I put a US $5.00 gold piece next to it for scale. This iridium comes from preciousmetalpurchase.com, I got it about two weeks after mailing a personal check. J-M notes that 178,000 ounces of iridium were used in 2012, I cannot reconcile that number vs. the other I recently read (198,000 ounces), maybe 198,000 is from 2013 (?). Nor can I explain the the over 300,000 ounces used in 2010 and 2011. Iridium is a very specialized material... Iridium is used mostly for crucibles for growing single-crystal sapphires used in LEDs for TVs (from http://en.wikipedia.org/wiki/Iridium). Iridium is very hard (6.5 on the imperfect but well known "Mohs Scale"), has a very high melting point and resists almost every chemical attack in town. It is also used in lesser quantities for high performance spark-plugs (racing cars for example) and in catalytic applications. Very nice! Here is their web page describing their iridium: http://www.rwmmint.com/products/iridium. The only real problem: they want $1595.00 for it! Yikes! Maybe the price has gone up lately. 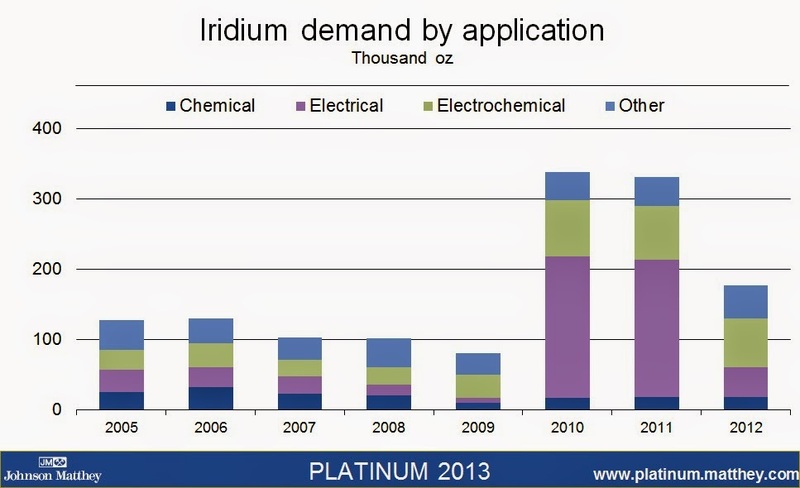 But, I now own four of the six Platinum-Group Metals: platinum (Pt), palladium (Pd), osmium (Os) and now iridium (Ir). If I want to complete the collection, all that is left are rhodium (Rh, available from kitco.com in Baird 1 toz bars) and ruthenium (Ru, also available from Rare World Metals Mint: http://www.rwmmint.com/). Their website is very interesting for people interested in exotic metals, highly recommended! Many fans of Bitcoin ("BTC") have a mobile "app" that they can use to make purchases of products with their BTC that they may have in their wallets on their smartphone. Almost all of these BTC apps were on "Android" (Google's OS, used in more smartphones than any other) devices. Recently (maybe a week ago or so ago), Apple came to their senses and has now allowed at least one BTC app to be used on their iPhones as well. Rumor had it that Apple wanted to make their own cryptocurrency, but it seems that enough people were ditching their iPhones for Androids because they liked BTC so much. Who knows? 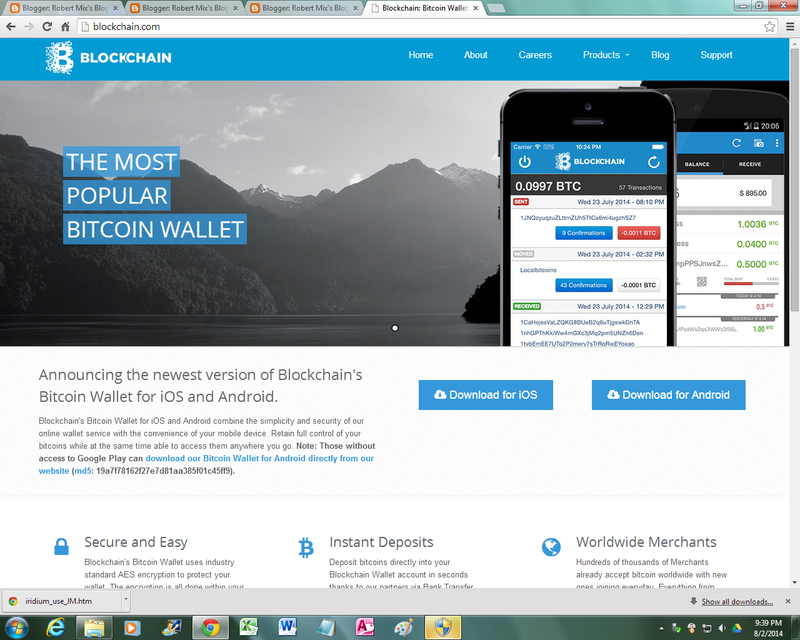 But, I installed the app by blockchain.com (note that is blockchain.COM, well known blockchain.info is apparently their owner though). Installation of this app required an hour-long upgrade of Apple's operating system (I have an iPhone 4S, old!, and then a few minutes for the app itself. I am still trying to figure out everything involved with this app, but the key features are the ability to have your own wallet in your iPhone so you buy things with your BTC as well as receive them. Remember this! Bitcoin sells at a huge premium in Argentina now! Argentina has capital controls in place that prevent their citizens from easily defending themselves from high inflation. While BTC price is very volatile, it is likely to outperform Argentine Pesos (LOL...). Interesting comments re larger denomination FRNs. Is that figure for currency in circulation only for the US? How do they keep a track on why dollars are inside and outside the US? Jonny, my guess is that the "Currency in Circulation" figure is for all FRNs that they print. I am not sure how they estimate how many dollars are in the USA vs. how many are saved outside. There are indeed a LOT of $100s outside of the USA, I did read somewhere that about (maybe more) of the $100s printed are outside the USA hoarded in countries with unstable currencies. And over half the $-value of FRNs printed are $100s. So, I guess probably at least 1/3rd of the US$ floating around are floating outside the USA.